Ringless Voicemail is a technique of dropping a voicemail onto a prospect’s phone without making their phone ring. This is known to be a very effective marketing technique with comparatively high response rate. Ringless voicemail is one of the latest marketing techniques in telemarketing, a pre-recorded message is dropped directly on your contact’s voicemail, where they can listen to the message at when they are free. This prompts a return call from the prospect, where you can tell them more about your product. 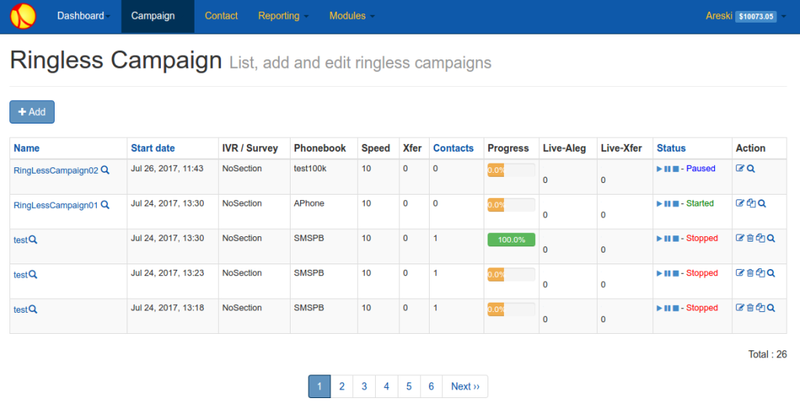 Newfies-Dialer’s ringless voicemail technology ensures that the whole message is left right after the beep, and creating a campaign is easy, upload your recording, upload your contacts and finally configure and start your ringless voicemail campaign and be ready to accept calls from your contacts. From your contact’s point of view, you have got you message over to them without disturbing their day with a call as with standard voice broadcasting, meaning that they will be more receptive to your message compared to a standard voice broadcasting message. Please contact us for more details and a demonstration of the system.